Nothing suitable in promotional marker pen? 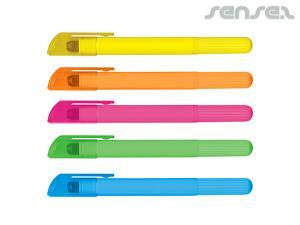 Marker pens are ideal marketing giveaway for office campaigns or conferences and conventions. We have a range of Marker pens to choose from. White board markers, custom logo printed promotional Permanent Markers in a range of colours. Our Mini marker pens are ideal for conventions and visitor gifts they can be clipped onto a lanyard for ease of use and are cost effective.